Sakata is a port town which flourished in the Edo Period. The area boasts beautiful buildings which date back to those time, as well as well kept old traditions. We introduce a tour of Sakata using the convenient JR EAST PASS (Nagano, Niigata). In the Edo Period, Sakata prospered as one of the important port towns of the Kitamaebune (*1) route. 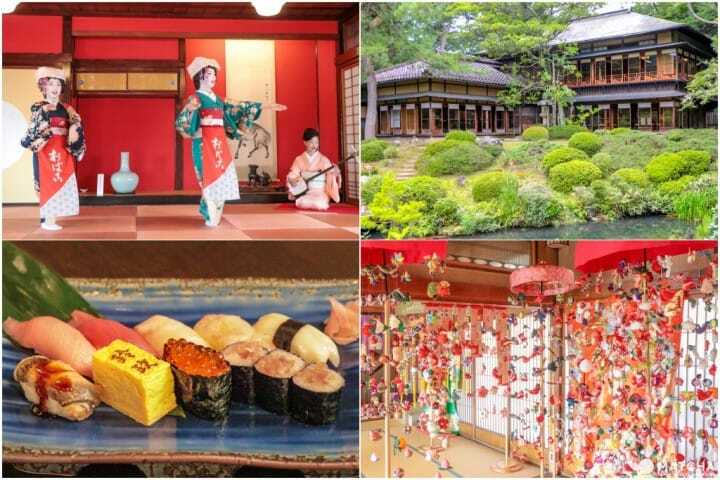 Sightseeing spots such as Homma Museum of Art, which boasts a rich collection of historical materials, and Somaro, where visitors can enjoy a dance performance by maiko at lunchtime, owes much to the heritage of Kitamaebune. We will introduce an itinerary that starts from Sakata City. From Tokyo Station, it takes about four hours and twenty minutes to Sakata Station, riding the Shinkansen to Niigata Station, and switching to the local Uetsu Main Line from there. We will be using the convenient JR EAST PASS (available for the Nagano and Niigata areas) for transportation. This discount ticket enables visitors to enjoy the sightseeing places and fine cuisine of Sakata. *1 Kitamaebune: Merchant ships that were active from the Edo (1603 to 1868) to Meiji Period (1868 to 1912). If you plan to visit various areas of Sakata, visit the Tourist Information Center located at Sakata Station, and rent a free bicycle. By registering your name, hotel telephone number and address, the bicycle can be used for a day. There are coin-operated lockers at the station, so stow away the big luggage, and let's begin the tour on a bicycle. From Sakata Station to Sankyo-soko -- 10 minute bicycle ride. Sankyo-soko, built in 1893, was a storehouse for rice on its way to Osaka on the Kitamaebune. It is located near the Sakata Port, with a row of zelkova trees in the back. It is said that the trees were planted to shield the storehouse from the sea breeze and direct sunlight. Sakata Yume no Kura is located inside Sankyo-soko. It is a sightseeing spot to where vistors can view exhibts of local dolls, buy souvenirs and enjoy dining. Local products such as Tsuyahime Cube (360 milliliter size), a famous Yamagata rice brand priced at 380 yen including tax, and Yamagata Daihyo, a 100 percent fruit juice priced at 154 yen including tax, are also popular souvenirs. Access Ten minute bicycle ride from Sakata Station. From Sankyo-soko to Homma Museum of Art - 10 minute bicycle ride. The Homma family was a major jinushi (*2) of Sakata. The family built its wealth in finance, rice trade and through Kitamaebune. Homma Museum of Art, built in 1947, displays the vast family collection of ceramic ware, paintings and calligraphic works. Visitors can also enjoy the Japanese garden called Kakubuen. Mt. Chokai, located on the border of Yamagata and Niigata Prefectures, stands out in the distant background, as the garden greets the visitors with a different scenery every season. Seienkaku, a wooden building, is located next to Kakubuen. In the Meiji Period (1868 to 1912), the building welcomed members of the Imperial Family and high-ranking government officials. There is a tea room on the first floor, serving matcha tea produced in Kyoto, along with sweets, for 500 yen including tax. Visitors can also enjoy the room on the second floor, which has been visited by the Showa Emperor. Fixed holidays From December to February/Tuesdays and Wednesdays. Year-end and New Year/From December 22, 2018, to January 11, 2019. The museum will also be closed from February 19 to 22, 2019. Access Five minute walk (two minute bicycle ride) from Sakata Station. There is no admission fee for Junior High and Elementary School children. Matcha tea and confectionary: 500 yen, including tax. From Homma Museum of Art to Suzumasa - 10 minute bicycle ride. Sakata faces the Shonaihama Coast, a treasure trove of seafood. If you want to taste sushi made with Shonaihama fish, go to Suzumasa, an established restaurant adored by the local residents, and also frequented by visitors from abroad. Suzumasa's main concept is "to serve fine sushi at a reasonable price." It is a restaurant which serves delicious sushi in a casual atmosphere. Tokujo Sushi (2,160 yen and up, including tax) offers a wide variety of sushi. They are all fresh, with a soft texture, and will melt in your mouth. Madai, served with bay salt and sesame, has a unique texture and taste. The lightly roasted Nodoguro is fragrant, and has a smooth texture. Fixed holidays Suzumasa will be closed on an irregular schedule. Price Tokujo Sushi: 2,160 yen and up. From Suzumasa to Sannou Club - 1 minute bicycle ride. Sannou Club is an example of historic architecture which reminds us about the legacy of Sakata, and its ryotei (*3) culture. Originally built in 1895 as a ryotei, it has been transformed over the years into a sightseeing spot. *3 Ryotei: A high-class restaurant serving Japanese cuisine, mainly used by business companies for entertaining their guests. The second floor is decorated with kasafuku. It is made from scraps of Japanese kimonos and hanged inside a parasol. The design varies from farm products to fish, animals and plants. Kasafuku symbolizes the prayer for the health of the family, business prosperity and a good relationships. Sannou Club hosts a sixty minute kasafuku workshop. Participants are asked to purchase a kasafuku kit (1,000 yen including tax) in advance. An English pamphlet will be handed out to visitors from abroad. Fixed holidays From March to November: There are no closed days. Year-end/New Year: From December 29 to January 3. From Sannou Club to Somaro - 1 minute bicycle ride. Somaro is a famous ryotei built in the Edo Period (1603 - 1867). It was rebuilt after being burnt down by a disastrous fire in 1894, and has been registered as an important cultural asset by the Japanese government in 1996. Takehisa Yumeji Museum (*4) is located on the first floor, along with a rest space which offers a view of a Japanese garden and the a training room for the dancers. A dance hall is located on the second floor. *4 Takehisa Yumeji: A prominent poet and painter in the Taisho Period (1912 - 1926). There is a twenty minute dance performance every day, starting at 14:00. Maiko are a part of the ryotei culture, as they enliven the atmosphere with their music and dance. After the performance, ride the bicyle back to the Sakata Station, and head for the next destination: Kamo Aquarium. the restaurant will be closed on Wednesdays. Adults: An additional charge of 800 yen. An additional charge of 500 yen. From Sakata Station to Kamo Aquarium - 35 minute taxi ride. Visitors flock to Tsuruoka City Kamo Aquarium to watch the jellyfish. The aquarium is listed on the the Guinness Book of World Records for breeding more than fifty species of jellyfish. The Jellyfish Dream Theater, with its special illumination, offers a dreamlike view! The most popular souvenir is the six-piece kurage iri manju (jellyfish bun), priced at 540 yen including tax. It is filled with sweet anko (red bean paste) along with jellyfish, and has a salty, seafood taste. Access A 35 minute bus ride on the Shonai Kotsu Bus from Tsuruoka Station. Get off at "Kamo Suizokukan" bus stop. Those who wish to enjoy Tsuruoka City should stay for the night at Yunohama Onsen, a hot spring facility, and take in the great view of the sunset. From Kamo Aquarium to Yunohama Onsen, it is a 10 minute bus ride. There is only one bus per hour, so check this timetable in advance. If you would like to learn more about Sakata and Tsuruoka, please take a look at this article: Shonai, which Flourished due to the Kitamaebune, Traditional Japanese Dance, and Jellyfish Aquarium + Taxi ＆ Yunoham-Onsen Lodging Plan. Picture courtesy of JR East. If you plan to visit Sakata or Tsuruoka in Yamagata Prefecture, then how about using the JR EAST PASS (Nagano, Niigata)? The pass user will be able to ride all types of JR trains and buses in the designated area. ** The JR EAST PASS is limited to international visitors to Japan. It cannot be used by Japanese nationals or foreigners residing in Japan with a visa other than the tourist visa. Yamagata And Niigata - 5 Local Dishes And Tasty Snacks You Must Try! Yonezawa, Yamagata - Experience Local Cuisine And Traditional Crafts! Yamagata – Enjoy Scenic Yamadera Temple And Exquisite Fruit Parfaits! Discover the many charms of the Tohoku Region: TOHOKU BUFFET. 2-Day Yamagata And Niigata Adventure - Hot Springs, Seafood, And Shrines! Yamagata And Niigata Travel - 5 Retro Spots Where You Can Slip Back In Time!